﻿ Yak Fibers from Weaver Creek Fibers, wholesale purveyors of luxury fibers. 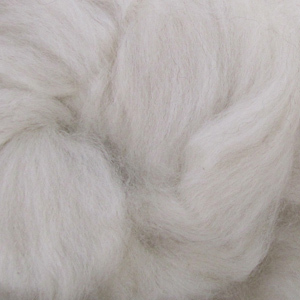 This beautiful natural white yak top is baby fine and deliciously soft. The Yak is an essential part of the lives of nomadic people living in eastern Asia. They are sturdy little animals that are used for their fibers, milk and as pack animals. Their downy undercoat is fine and short but in the preparations into top, they spin easily. The fiber comes in a deep chocolate brown as well as what we call "de-pigmented", or white. It feels cool against the skin but keeps the wearer comfortably warm and is especially prized in blends with merino or tussah silk. Spin it tightly or with lots of loft, depending upon your final product. Our ready-to-spin Yak fibers are cleaned and dehaired. It has an approximated micron count of 21. Yaks are members of the bovine family. They are unique animals that live mainly in Qinghai and Tibet plateau. They are a two coated animal with a coat of long hair and a soft underdown which sheds annually and is normally gathered. Yaks can weigh over 1200 pounds and have a lifespan of 20-25 years. Yak fiber is soft and smooth with wonderful hand. It exists in several colors, including shades of gray, brown, black and white. The mean length of yak fiber is about 1.2 inches with a fiber fineness of 15-22 microns. It is combed or shed from the yak and then dehaired. The result is a splendid downy fiber similar to that of the camel. Yak Wool has always been one of my favorite fibers so I have put a great deal of effort into finding the best yak wool possible. Weaver Creek Fibers offers extremely soft yak wool (ranging from approximately 18.5 - 21 microns) with virtually no guard hair. In addition, we offer yak wool in several colors -- light brown/grey, brown, dark brown and depigmented white -- which are beautiful together or apart. The brown/gray yak wool is also sufficiently light in color for dyeing. Many hand spinners are afraid of yak wool’s short staple length in that it is only approximately one inch long. But because yak wool has great crimp and is not slippery, it is actually quite easy to spin. It makes a terrific lofty, woolen spun yarn.